Beijing Opera (AKA Peking Opera) is a 200-year old art form, now considered Intangible Cultural Heritage of Humanity by UNESCO. There’s a repertoire of over 1400 operas, based on things like Chinese history, Chinese folklore and life in modern China. 京剧 (Jīngjù, Beijing Opera) Your browser does not support the audio element. 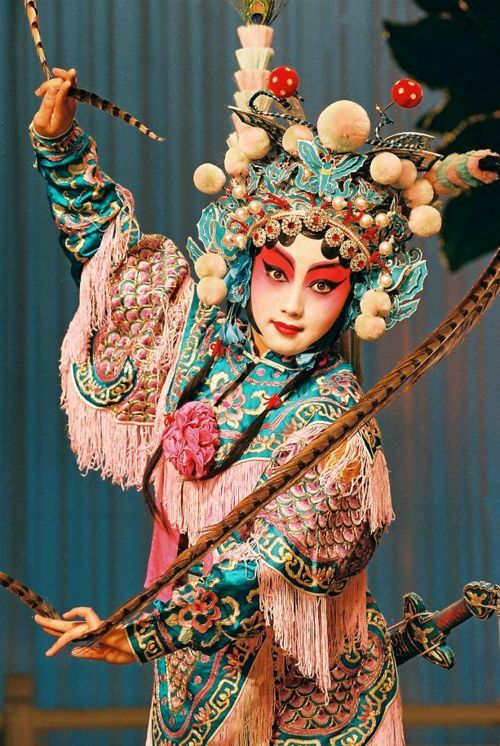 As it’s such an important part of Mandarin Chinese culture and history, I thought it would be interesting to take a detailed look at Peking Opera. So in this post, I’ll first take you through how it’s different to Western opera. I’ll then tell you a bit more about its use as a tool for propaganda. Before I start, I should point out that Peking Opera is not just in Beijing (previously known as Peking). There are major troupes throughout China, the Chinese speaking world, and even the United States. There are similarities between these two traditions. For example, both have a story and performers in costumes singing. However, there are also some big differences, as detailed below. There’s a big emphasis on movement: Dancing and martial arts are both considered key elements. In Western opera, performers are divided into groups based on how high they sing: You have basses then tenors then altos then sopranos. (There are a few others, as well). 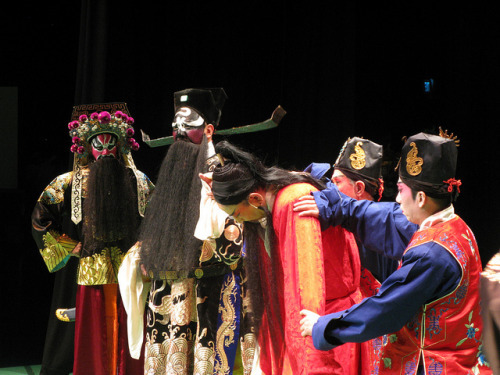 In Peking Opera, performers are divided into fixed character types. 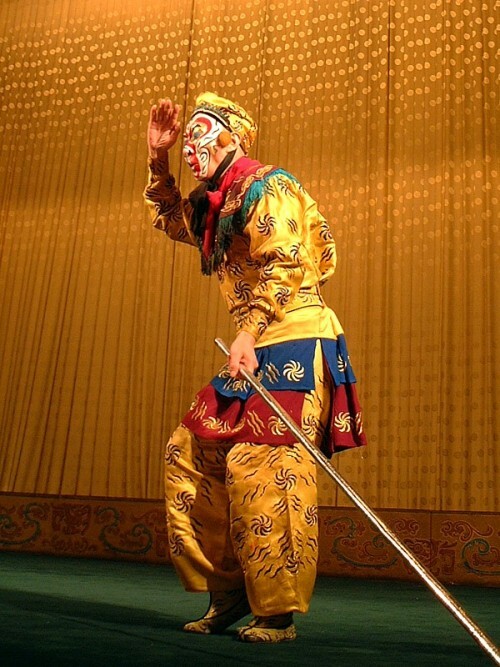 There are shēng 生 (male characters), dàn 旦 (female characters), jìng 净 (males with painted faces) and chǒu 丑 (clowns). Each role has its own singing style – but can be at various pitches. That means you can get female performers playing a male role, such as shēng. You can see jìng characters in the image below. Peking Opera is also much more stylized than Western Opera. For example, you can tell the jìng characters by looking at what color their face is painted. Red means loyalty, black means forthrightness, and so on. Movements are also stylized to make them round. So when looking at an object, the character will move their eyes in a circular motion from low to high before finally looking at the thing. This stops there being harsh angles when they move their head and eyes. And, when a character is changing direction, they’ll walk in an S-shape rather than just turn. There are also set movements to convey certain meanings. So if a performer raises their arm as if they’re holding a lantern, the audience will know that it’s night time. You even see stylization in dialog: Performers create a rhythm in their speech by lengthening certain syllables. Peking Operas used to be unbelievably long. Many operas from the Qing Dynasty had 20 or more acts and would take several days to watch. The Emperor Qianlong even commissioned an opera with an epic 240 acts. The picture below is from a modern adaptation of this opera. Today, audiences watched a condensed version, called zhezi xi. This is just one act, taken from a full opera. This act is generally the most exciting one from the whole opera. Before starting this section properly, let me give you a quick introduction to China politics at the time. After Japan was forced out of China at the end of World War Two, there was a civil war in China between the Communists (led by Chairman Mao) and the Nationalists (led by Chiang Kai-shek). In 1949, the Communists won the war and established the People’s Republic of China. The Nationalists fled to Taiwan – where they remain to this day. As you’ll see, both the Communists in China, and the Nationalists in Taiwan used Peking Opera as a propaganda tool. Although they fled to Taiwan, the Nationalists were keen to show themselves as the sole representative of Chinese culture. This meant that Peking Opera, an important part of Chinese culture, received a huge amount of government support. Until the 1990s the Taiwanese Ministry of National Defense’s propaganda department completely funded several troupes. (The Ministry of Education also supported one troupe). In contrast, Taiwan Opera – which was more popular in Taiwan, but not as useful politically – didn’t get funding, and was actively discouraged. Although it only had 1/260th of Chinese territory, Taiwan was effective at convincing the world that it was the ‘real China’. Communist China wasn’t allowed into the UN until the 1970s – and many countries didn’t form relations with it until then either. Part of this success has to be attributed to the government’s support of traditional Chinese culture. Interestingly, Taiwan (pictured below) has had a shift of policy as it has become more democratic. As well as no longer funding the Peking Opera, Taiwan sent a Taiwanese Opera troupe to cultural celebration held in Mainland China. This was a way of establishing itself as separate – and creating a new identity for itself. The Communist Chinese government also used Peking Opera as a political tool. This wasn’t to increase its legitimacy across the world, however. This was to increase its legitimacy within China. As part of the Cultural Revolution between 1966 and 1976, traditional Peking Opera was banned. The government claimed it was bourgeois – so contrary to the ideals of communism. Instead, new “model operas” were created. These all confirmed to Mao’s view that “art…must conform to proletarian ideology.” The operas told stories from China’s recent revolutionary struggle. This was a great way to glorify communism and the communist leadership. Like in Taiwan, this propaganda ended as the government became more liberal. Not only can you now watch traditional Peking Opera, it is often broadcast on one of the state television channels. 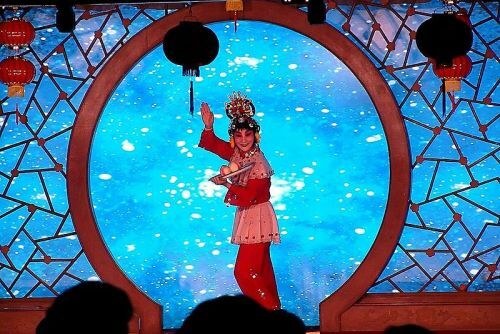 I hope you enjoyed this post – and learned more about the performance of Peking Opera, as well as its role in recent Chinese politics. If you want to learn more, have a look at Chen Kaige’s 1993 movie Farewell My Concubine. It describes the 7 years of hard training pupils used to have to go through before they could begin their career. Farewell My Concubine was the first Chinese film to win the Palme d’Or at the Cannes Film Festival. It was also nominated for two Oscars. You can also watch this short collection of 12 traditional pieces of Peking Opera on YouTube. Learn more about Chinese culture today, start to learn Chinese painting now.